InFocus represents a breed of software that is best described as Enterprise Resource Planning (ERP). ERP software is distinguished by its ability to deliver an integrated suite of business applications. In the case of InFocus, these applications include: Accounting, Job Cost Management, Time and Billing, Resource Planning, Marketing Support, and Business Intelligence (BI). These applications are fully integrated into InFocus rather than existing as a collection of loosely linked modules or third party add-ons. The ability to deliver an integrated suite of applications is fundamental within the architecture of InFocus. ERP capacity was designed into the software from inception and incorporated into the original tables and scripted code. Ongoing development has assured that the software makes best use of the latest technologies and design approaches. Unlike many software products still marketed to the A&E design industry; InFocus is not the result of a cobbling of new modules and features onto a 1980’s legacy time and billing system. Releasing big features like ones found in InFocus 2015 is exciting. But it’s just as important to consistently release fixes and small improvements that help our clients work smarter. InFocus 2015.1.1 is one of those releases. It addresses small bugs, makes the UI behave more consistently across applets, and improves keyboard navigation. Clients with access to Clearview Support can view the change log here. We’re excited to announce InFocus 2015. With over 200 new features, fixes and refinements, it’s a big release. Almost everything we’ve done is in response to a client survey given a few months ago. In particular, clients told us they needed easier reporting, faster loading in key areas and a more cohesive user experience. InFocus 2015 delivers that and a lot more. Building reports can be painful. It often requires using antiquated design tools and complex SQL queries. ReportBuilder fixes that. It’s a slick tool that allows anyone to design in minutes what normally takes a report professional hours. It’s better shown than talked about, so watch this video to see how it works. With InFocus 2015 we’ve made the InFocus Dashboard the most powerful in the industry. In addition to six new chart types and cleaner presentation, we’ve developed a new Data-Grid Widget (Gridget) that allows you to interact with your data in an Excel-like, editable grid. Gridgets can be used to drive charts, workflows and other processes—all from your Dashboard. 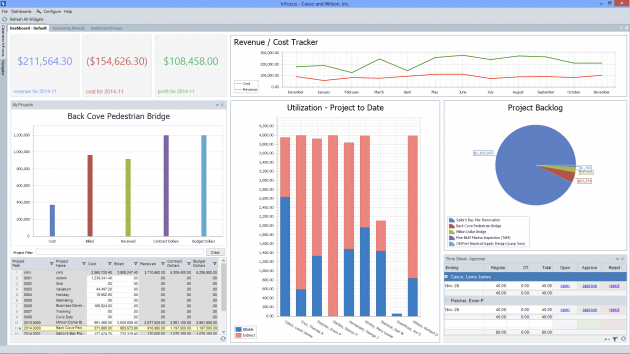 What’s more, InFocus 2015 offers unlimited dashboard layouts. Create one dashboard with graphs for high-level firm metrics, another for viewing everyone’s timesheets, and another for recent AP and AR transactions. There are a lot of details in InFocus 2015 that add up to a more productive experience. In some key areas like PA and PM Bill Review, record loading speed has been dramatically improved. We’ve also streamlined the overall interface to help you get where you need to go quicker. For example, clients and projects are now links within grids and lookups. If you’re in the Sales Journal, one click gets you to the detail screen of the client or project. And with split tabs you can easily do side by side comparison and reporting. Lookups have been expanded to include key search fields like Invoice Number and Check Number. For example, in Sales Journal start typing an Invoice Number or SJID and results appear immediately. If you are a client at Clearview with support site access, check out the Release Notes for more details. We hope InFocus 2015 makes you even more productive in 2015. When is QuickBooks a Good Choice for Your AE Firm? QuickBooks is a well-known accounting software package for small business. It is often recommended to startups and small businesses by their CPAs, especially if that CPA does not have a lot of experience with professional service firms, primarily because (a) it is fairly cheap, and (b) the accountant knows it (more convenient for the accountant). 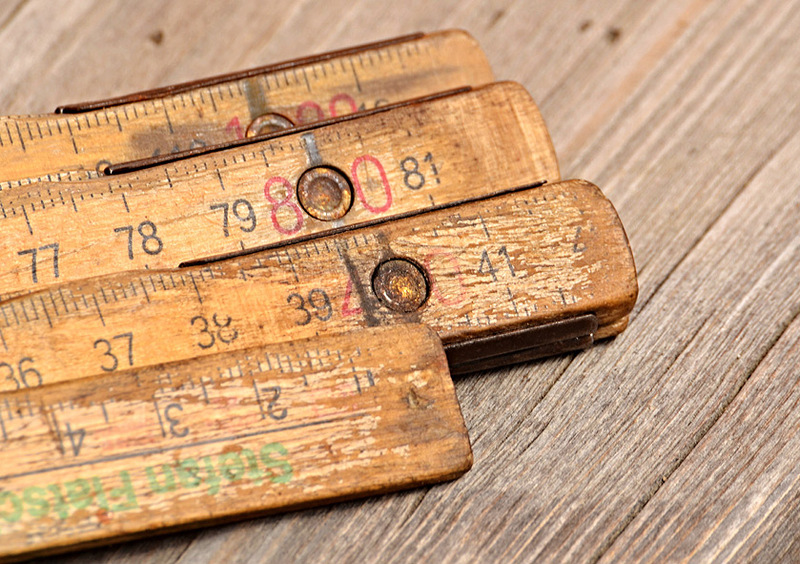 It might seem strange to talk to architects and engineers about the importance of measurements. They live and breathe physical measurements. But we’re going to talk about a different kind of measurements. Measurements that tell us how our businesses performed in the past, how they are performing now, and how they will perform in the future. Recently an associate and I were discussing the need for accounting controls in smaller professional service firms. He agreed there was a need, but thought it unrealistic, asking “How can you implement segregation of duties in a ten person firm where one person manages the accounting function?” He made a good point, but I have seen my share of clients living through a myriad of accounting messes that could have been prevented with adequate controls. Clearview is a tight-knit company, so we’re very intentional about who we hire and promote. We’re excited about two recent decisions that make Clearview even stronger. First, Rob Wintz has been promoted to CFO. When Rob joined Clearview in 2011 he brought over 30 years of experience as a CPA. We couldn’t be more pleased to have him as our new CFO. Read Rob’s official announcement. Second, Eric Kimmet joins us as director of customer support. As Clearview continues to grow we want to make sure that our clients get amazing support, and Eric will be a big part of that. Because he used InFocus at the architectural firm he is coming from, Eric hit the ground running. He also has experience with BST and other systems, so he’s able to help clients make the transition to InFocus. Welcome Eric! Read Eric’s official announcement. The best way to get good decisions out of people is to give them timely, accurate information that answers their questions. This gives them both the motivation to act and the resources on which to act. Historically, however, this was not done. Throughout the accounting cycle—usually a calendar month, but sometimes a calendar quarter—operating data was collected that was primarily of interest to the accounting department, mostly numbers preceded by dollar signs. At the end of this period, after another period called the closing process, reports were printed out, usually defined by what an accounting system could generate. Much of this information was considered confidential, so it was distributed to the principles of the firm, to the CPA, and maybe to the bank or lending institution that may have provided a line of credit. Professional service firms like architects and engineers came to realize that there was also important project-oriented data that could be collected, but it tended at first to be collected and compiled on the same cycle, by the same people, printed and distributed to operations personnel, including project managers. The problem with this cycle is that it provided data that was between one week and six weeks old, in a defined format that may or may not have met PMs needs, and all too often of questionable accuracy. Depending on the PMs workload and the level of detail, these paper reports could have been overwhelmingly voluminous, making it difficult for the PM to find the critical information he needed, and usually long after it would have been helpful. In many engineering firms several projects could have completely come and gone in this reporting cycle. Most of today’s professional service reporting systems are capable of much more than what the old system provided, but the old patterns are still followed: print a lot of reports, usually around the billing cycle and distribute them with more emphasis on billing than on control. Let me propose four changes that will greatly empower PMs to make more timely and accurate decisions. How much cash should an AE firm have on hand? Managing a successful business requires effectively managing cash flow. And managing cash flow effectively means knowing how much cash to have on hand. To know that that we need to understand why cash is needed in the first place, then couple it with a thorough analysis of a firm’s revenue and expense cycles, preferably using an interactive model. But let’s start at the beginning: how much cash on hand should an A&E firm have? Do we have enough cash? Based on what I see from my consulting with A&E firms, everyone has a different idea of how much cash is enough. I’ve seen 20 person firms holding several million dollars of available cash. I’ve seen hundred person firms that keep barely enough cash on hand to meet next week’s payroll. At both extremes, these firms are profitable and appear to be near-term stable, emphasis on the words appear and near-term. That being the case, is there a rule of thumb? On average, firms in the architectural/engineering design sector maintain cash balances equal to approximately 20% of their total assets. This equates to about 8% of their annual sales, some reporting as low as 4%, others as high as 12%. Benchmarking your firm’s cash balance against some industry standard is not very meaningful, at least not without considerable investigation into what is behind the numbers. We’re excited to release InFocus 2, the culmination of months of effort. It includes some of our most requested features as well as some new ones we think you’ll love. Here’s a quick overview of what’s new. Up to this point managing projects in InFocus involved going to several different applets. No longer. Project Central brings everything together in one streamlined place to view project metrics and manage project budget and resources. Check out the video below to see it in action. Multi-currency is now built into InFocus at a fundamental level. Every journal entry, invoice and budget can now be specified in your currency of choice. You can set when you want the currency evaluation to occur and InFocus takes care of the rest. Wherever you do business InFocus is there for you. The new interface is cleaner, more professional, and a pleasure to use. Keeping track of expenses with InFocus is easier than ever. Mobile Time & Expense now supports attaching images to your expense sheet directly from your device. Just add a line item, snap a photo, and you’re done. If you are a client at Clearview with support site access, check out the Release Notes for more details. We hope you’ll find this InFocus to be the most powerful version yet.